If you're expecting homemade almond cheese to taste like cheese made from cow, sheep or goat's milk, you'll be disappointed. But if you want a vegan, lactose-free, dairy-free substitution that's similar to cheese, then this slightly sweet, tangy and creamy almond cheese is for you. Once you try this basic recipe for almond cheese, you can begin experimenting and perfect your own version of almond cheese, which is a fun project. Below I've included links to other almond cheese recipes I've found - try them all to find the one you like best. 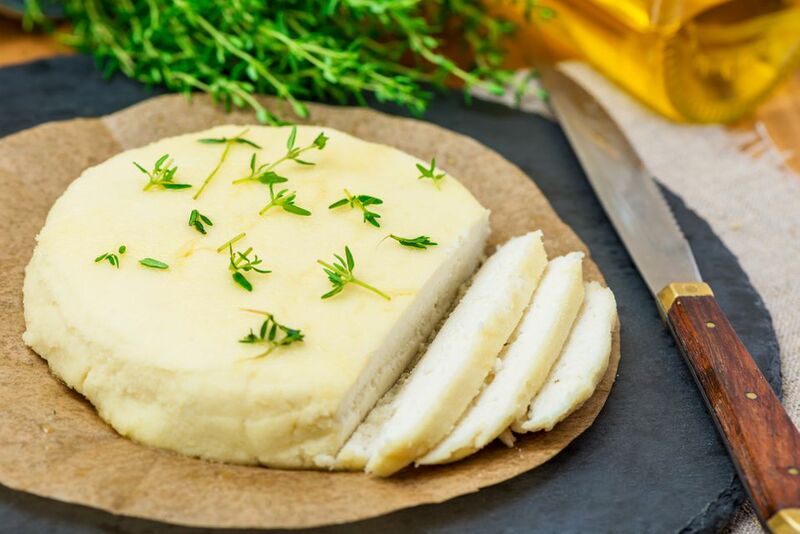 The recipe that seems to have inspired most of the almond cheese recipes out there is almond feta cheese with herb oil published by Vegetarian Times. Note: while there are multiple steps to this recipe, this almond cheese recipe is broken down into workable categories to help you better plan for preparation. Put the almonds in a food processor or high-powered blender with the lemon juice, olive oil, salt, and water. Blend until smooth, about 5 minutes. Scrape the mixture into double-layered cheesecloth lining a colander. Gather the cheesecloth tightly around the almond mixture and secure into a bundle by using a rubber band or string to tie the top. Give the bundle a few gentle squeezes to remove liquid. Leave the bundle in the colander and place in the refrigerator overnight over a bowl or rimmed plate to catch any liquid that might drain. Refrigerate for at least 12 hours. This helps the texture of the cheese become firmer. Discard any liquid that drains out. Carefully peel the cheesecloth off of the almond “cheese”. The “cheese” will have a consistency similar to cookie dough. At this point, the almond cheese can be eaten as a spread or it can be gently shaped into a round about 3/4-inch thick and baked at 300 F for 30 to 40 minutes. After baking, the top will be dry and slightly firm. The inside will still be creamy. Blanched almonds are almonds that have their skins removed; you can have someone else do it for you or do it yourself. First, start by boiling water over the almonds and let the almonds soak for a few minutes. Drain and rinse the almonds then rub the almonds with a towel or just use your fingers to peel and pop the skin off. Removing the skin before making almond cheese gives the cheese a smoother texture and lighter color that looks like cheese. You can make the cheese with the skin on if you prefer. Soak the blanched almonds in cold water for 24 hours before making the cheese. If you choose to soak the almonds before making this recipe, begin the night before. Place the almonds in a glass bowl or jar and cover completely with water. Cover the bowl or jar and refrigerate for 24 hours. Making this recipe for almond cheese is quite simple, but requires planning ahead: If you choose to soak the almonds, then start the night before you want to make the cheese. The cheese also needs to be refrigerated for 12 hours before baking it. The cheese can be flavored by adding seasonings such as fresh garlic, fresh herbs, and spices. Some recipes flavor the cheese with nutritional yeast. You can add these ingredients at the beginning when you are blending ingredients in the food processor or blender. You can also drizzle olive oil and fresh herbs over the almond cheese after it bakes.